Summary: Qatari foreign policy has been incautious and provocative and Qatar is reaping what it sowed, although it can accurately describe its enemies as hypocrites. Hard to see anything but regime change satisfying Abu Dhabi, though Saudi Arabia would be content to compromise. We are grateful to David Roberts for the posting below. He is Lecturer in the Defence Studies Department at King’s College London, former Director of RUSI Qatar and author of Qatar: Securing the Global Ambitions of a City State. Qataris remain equally defiant, outraged, and indignant that they continue to suffer under blockade from the quartet of Saudi Arabia, Bahrain, UAE, and Egypt. The central sentiment in Doha is that Qatar has done nothing that warrants this kind of punishment. Indeed, there is only the sketchiest, mumbled admission that any Qatari foreign policy has gone awry in recent years. But it is important to separate these two issues and develop a sense of, first, the collateral damage of Qataris recent foreign policies and, second, to then ponder whether the punishment meted out by the quartet fits the crime. The Qatari state presided over a set of deeply intrusive foreign policies in recent years that reached into a range of countries and, in a loosely or even uncoordinated fashion, sought to support like-minded groups against non-like-minded groups. In other words, Qatar, like every state, has played favourites supporting its clients over others. Qatar used a range of tools of state including applying kinetic military force, supplying military material, offering financial inducement, paying salaries, conveying diplomatic support, supplying food, providing media support, supplying energy, trading on behalf of sanctioned clients, and setting up whole new political parties. Qatar did this unilaterally, bilaterally, and multilaterally. During the Arab Spring, Qatar involved itself in depth in Syria, Libya, Tunisia, and Egypt, countries with a combined population of 132 million, compared, for the record, to a total number of Qataris around 300,000. As a British national, I can recognize a disastrous foreign policy in the Middle East when I see it. Let’s leave aside the fraught question of whether Qatar should have engaged in these intrusive policies – a not insignificant question on its own – and focus briefly on whether Qatar could, in a literal sense, actually undertake its foreign policies in any kind of a sensible fashion. Why did Qatar channel the vast majority of its support to Libyan rebels through Ali Al Sallabi and then, through Ali, to his brother Ismael, and onto Abdel Karim Belhaj? That Ali is loosely associated to the Muslim Brotherhood in Libya is important. That he was, at that time, still relatively influential though not resident in Libya was also useful. But perhaps the central reason that he was selected was his sheer availability. He was there, in Doha, on Al Jazeera, as these decisions were being made, and this proximity was his first and foremost selling feature. What background checks did the Qataris run on him and his motley crew? What compliance policies and procedures did they have in place to make sure that the funds and material they were supplying to him were going where they wanted their support to go? How, for that matter, did the Qataris with vanishingly little expertise in the nitty gritty of Benghazi and its environs, even decide on what they wanted? The answer to these questions is that, in essence, the Qataris winged it. Only when pressed by international allies, particularly in Syria, is there evidence that Qatar systematically sought to itemise and list which groups it gave what. The point is that there are legion critiques to level at Qatar in terms of the execution of its foreign policy across the MENA region during the Arab Spring. But there is more. The quartet are increasingly ranged against Qatar’s very foreign policy orientation. Qatar’s reflexive support of groups along the political Islam spectrum, a result of practicality and some preference, wrangles at a base level with the quartet’s increasingly strident Jeffersonian proclivities (separation of institutional religion from politics). These states look at Qatar as an irritating state of barely 300,000 people enjoying the world’s strongest welfare state with an Emir who sleeps with arguably the most important de facto US Air Force base outside continental America a couple of kilometres away from his bed. These quirks of fate have created this state with a leadership that simply feels immune to the consequences of its whim-like foreign policies. Not even content with – from the quartet’s perspective – sowing trouble and stoking Islamist forces in Syria and Libya and destabilizing Egypt, nearer to home Qatar also nationalised Bahraini citizens meddling in delicate local population balances and Qatari media consistently acts as an effective large-scale rallying cry for a range of actors often hostile to Gulf governments. Ultimately, the quartet concluded that Qatar’s leaders are arsonists cocooned in a fireproof suit, liberally and without heed of the consequences, setting smaller and larger blazes around the region. Some Qataris, though not many, admit that their foreign policies – like those of all states – have gone awry. But that, in any case, the level of scrutiny on Qatar is vastly unfair and out of proportion and, furthermore, the quartet are being monstrously hypocritical, criticising Qatar’s support of non-state actors and for interfering in the internal affairs of other states while doing precisely the same things themselves. On the first count, Qataris need to wake up. The state of Qatar has, since the late-1980s, pursued an assiduous policy of accruing international influence and notoriety as a part of an innovative security strategy. Over the decades this included a preference for buying trophy assets, such as the world’s most famous shop, Harrods, and not investing obscure financial derivatives; establishing, running, and supporting the Arab World’s most influential media empire in Al Jazeera; winning the rights to host the world’s most popular sporting event, the FIFA 2020 world cup; and more recently having another trophy asset (Paris St Germain) buy the world’s most expensive footballer, Neymar, from Barcelona, one of the world’s most famous football teams that Qatar Airways sponsored for a few years. In short, Qatar cannot spend hundreds of billions of pounds attracting the world’s attention and expect to just have it on their own terms: Qatar cannot have its cake and eat it. On the second count, Qatar is right. The quartet are acting hypocritically. This is politics; all states are hypocrites when they need to be and when they feel they are correct. But Qatar need to reflect more on this point. Qatar is accused of having close and destabilising relations with Iran. But Dubai, one of the UAE’s federal states, has the region’s most significant trading relationship with Iran. And Oman has, in a similar if less conspicuous way than Qatar, often extended diplomatic olive branches to Iran. Qatari indignance is even greater when it comes to issues related to Islamism. Whatever Qatar’s relations with the Muslim Brotherhood, there are no active Brothers in Qatar’s Parliament; something that Kuwait and Bahrain cannot say. Why then has Qatar been signalled out? Because, in a nutshell, Qatar has profoundly lost the trust of its allies. The quartet seem to have resoundingly agreed that Qatar simply does not take their interests or security to heart. Qatar signed a raft of agreements, understandings, and undertakings in 2013 and 2014 to modify its behaviour. Tamim thought he was signing loose agreements to slowly reform in the coming years; his Gulf neighbours thought he was signing legally binding and faithful promises to reform more or less immediately. 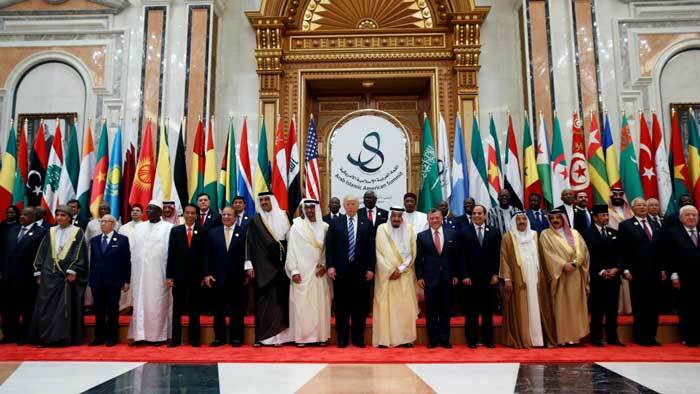 The Gulf triumvirate of Saudi Arabia, Bahrain, and the UAE thus see little point in re-entering negotiation with Qatar. The rulers in Abu Dhabi in particular have long taken Qatar’s proclivities to heart. They disagree with Doha’s foreign policy orientation and with its support of Islamists for political reasons. But, personally speaking, they also want Islam to remain important but in the private, not public or governmental sphere. Qatar’s frequent use of groups who actively use Islam for political purposes has built up over the decades a quite intense personally-rooted animosity in Abu Dhabi. All that has changed recently is that they found a kindred ally of sorts in Mohammed bin Salman in Riyadh. Together, united in their desire to reform some of the core modus operandi of Arab politics, at home and abroad, these two states have decided to stem at source one of the major flows of finance as well as diplomatic and economic support for ideas related to political Islam that they see as playing a consistent role immiserating swathes of the Arab World. For Abu Dhabi, therefore, there is almost no viable solution bar regime change in Doha. Presently, Mohammed bin Salman in Saudi Arabia has other things to keep him occupied. However, there is no sense that he is as personally riled by Qatar and thus as intransigent. In all likelihood, at a time of his choosing, Mohammed bin Salman will extract a price from Doha, likely in the form of an investment in the Saudi 2030 vision, for returning from the cold. But there are no inclinations from any side that compromise is nearby. Qatar remains beholden to a funk of anger that is understandable on many counts, but useful on no counts. The state has been remarkably successful at rerouting its imports and coming to terms with the tactical repercussions of the blockade. If Qatar’s leaders are to find some kind of strategic reply to the quartet, it needs to begin by understanding the roots of the quartet’s anguish to grasp how its foreign policies have so deeply and abidingly alienated its three bordering states.